Our customer service is available on ordinary weekdays between 8.00 am and 5.30 pm. We are closed on the weekend and on Bank Holidays. We will respond to e-mails within 24 hours. Any email received out of hours will be dealt with the next working day. Baricol® Complete – an important part of your new life! Baricol® Complete is the straightforward way to get the vitamins and minerals you need after weight loss surgery. The vitamins and minerals that are most impacted are iron, calcium, vitamin D and vitamin B12. Not getting enough of these vitamins and minerals can have serious health implications, such as developing anaemia, nerve damage or brittle bones. It is therefore important that you take vitamin and mineral supplements after having weight-loss surgery. Baricol® Complete gives you all the vitamins and minerals you need in one single tablet. It can either be taken as a chewable tablet or a tablet that you can dissolve in water. It is specially formulated for people who have had sleeve gastrectomy and gastric bypass surgery. Sign up for a subscription and save money! 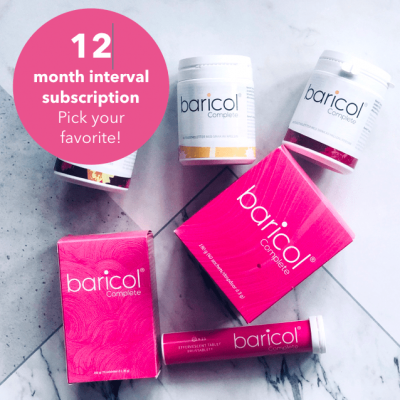 Baricol® Complete ongoing subscription enables you to always have vitamins & minerals on hand at a beneficial price. When you select this option, all the products are delivered at the same time. 3 months later you receive the next delivery. Read more about subscriptions here. Select effervescent tablet, chewable tablet, powder or swallowing tablet from the drop-down list below. Baricol® Complete ongoing subscription enables you to always have vitamins & minerals on hand at a beneficial price. When you select this option, all the products are delivered at the same time. 6 months later you receive the next delivery. Read more about subscriptions here. Baricol® Complete ongoing subscription enables you to always have vitamins & minerals on hand at a beneficial price. When you select this option, all the products are delivered at the same time. Twelve months later you receive the next delivery. Read more about subscriptions here. Baricol® Complete ongoing subscription enables you to always have vitamins & minerals on hand at a beneficial price. When you select this option, all the products are delivered at the same time. 1 month later you receive the next delivery. Read more about subscriptions here. Victoria started taking Baricol® Complete shortly after her weight-loss operation.She had struggled to take traditionalliquid vitamins and iron, and found the chewable Baricol® Complete tablets a lot more palatable. Kungsportsavenyn 21, 411 36 Göteborg, Sweden. We offer secure and flexible payment solutions in conjunction with Stripe and rapid delivery via DHL.